Mango powdery mildew leaves a whitish powdery growth on flowers and flower buds, which then become dry and crumble easily. The fruit can have gray lesions, and leaves will turn purplish brown and curl up. Question: The purplish, shriveled leaves falling into our yard were analyzed by the Department of Agriculture and determined to be mango powdery mildew. However, due to the height of the tree, the pathologist advises against treating it with the prescribed sulfur and potassium bicarbonate because drift from spraying would "harm people and other nontarget areas." I have searched the Internet but cannot find more information on how this disease can be otherwise contained. It has already affected trees in our yard, including a pomelo and starfruit. Is the disease destined to run rampant in the community like whitefly? Answer: Mango powdery mildew is prevalent throughout the state and is a seasonal problem, according to Scot C. Nelson, a University of Hawaii associate specialist in plant pathology, based with the UH Cooperative Extension Service in Hilo. Probably the best you can do for now is to either use a fungicide on the lower reaches of the tree or prune it. For questions like yours, a good resource is the Oahu Master Gardener Hotline. Call 453-6055 between 9 a.m. and noon weekdays. The hot line is staffed by volunteers and sponsored by the Cooperative Extension Service. Urban Horticulturist Jayme Grzebik returned our call and pointed us to a Web site maintained by the UH College of Tropical Agriculture and Human Resources: archive.constantcontact.com. That site provides information on "Plant Disease of the Week," including mango powdery mildew for the week of Feb. 5. Nelson, author of the article on this commonly found fungal disease, said your best course of action at this point is "to try to treat what you can reach with a fungicide." Or, you can prune the tree back to make it a more manageable size to treat. 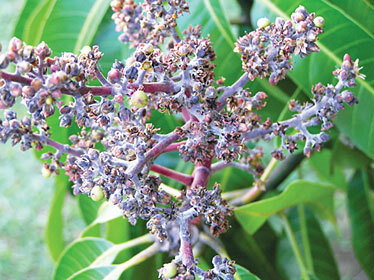 Mango powdery mildew does not kill the tree, but is a seasonal problem, coming every year at the time of flowering, killing the flowers. "The idea is to protect the flowers at the time of flowering with fungicide spray," Nelson said. He lists some of the fungicides registered in the state for controlling mango powdery mildew in his article. Among them, Drexel Sulphur, Kaligreen and Bi-Carb Old Fashioned Fungicide (main ingredient potassium bicarbonate) works well, he said. His article has a special notation on baking soda (sodium bicarbonate), saying mixed with water, it is "an old home remedy spray for powdery mildew." However, he points out it is not approved for use as a pesticide in Hawaii. No baking soda product is licensed by the state Department of Agriculture for use as a pesticide in Hawaii. You can check hawaii.gov for the list of approved pesticides. Meanwhile, mango powdery mildew is found mainly in areas where it is drier, with warm days and cool nights. "It's one of the few fungal diseases that does more damage in drier locations," Nelson said. It is found worldwide and was first reported in the islands in 1983. One way to try to prevent the disease is to keep weeds trimmed, because a weed-infested area would create higher humidity, Nelson said. Before planting a mango tree, Nelson said to consider planting less susceptible "cultivars" (cultivated varieties of a plant), since some tend to do better than others in Hawaii. For homeowners, he suggests just checking to see what is flourishing in the immediate neighborhood. "That's the type of tree they should plant," he said. "If they like the tree and the fruit is performing well, then go with that one." Anyone interested in receiving e-mails about plant diseases from the University of Hawaii can sign up by contacting the Oahu Master Gardeners by e-mail, at oahumg@ctahr.hawaii.edu, or calling the Oahu Master Gardener Hotline, Grzebik said. The city Refuse Division believes this was an isolated incident, saying it "seldom" receives reports like yours. Any other readers experience such a theft?